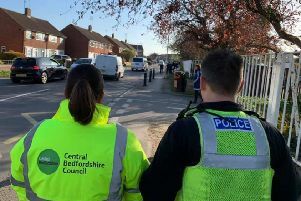 Waste flytipped at the infamous “Train Robbers’ Bridge” has led to the prosecution of the operator of a Leighton Buzzard road lining company. Lee Higgins, 45, pleaded guilty at High Wycombe Magistrates Court on October 4 to offences relating to waste dumped at Bridego Railway Bridge in Mentmore. The court heard that in September 2016 reports of dumped waste were made by Mentmore Parish Council to an investigator from the Waste Partnership for Buckinghamshire. On September 6 the investigator inspected the dumped waste and found a large number of industrial paint tins which had contained road lining paint. Details on paperwork within the dumped waste were traced to a road lining company from Leighton Buzzard operated by the defendant Mr Higgins. When interviewed, Mr Higgins denied dumping the waste, but admitted transferring the waste to an unknown third party without checking their identity or credentials as a waste carrier. The Magistrates fined Higgins £450, and ordered him to pay clean-up compensation and prosecution costs of £3,000. A victim surcharge of £45 was also levied – making a total to pay of £3,495. Aylesbury Vale District Council Cabinet Member for Environment Sir Beville Stanier, speaking on behalf of the Waste Partnership for Buckinghamshire, said: “This dumping would have been avoided if Mr Higgins had used a legitimate waste company rather than paying a ‘man with a van’ cash in hand. Since November 2003 the Waste Partnership for Buckinghamshire has secured over 620 convictions against individuals and companies for illegal dumping and related offences, resulting in a significant saving to the Buckinghamshire taxpayer over the period, principally through reduced removal and disposal costs.